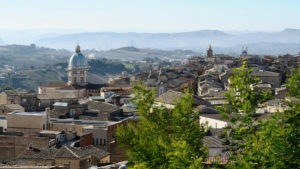 Located at the very heart of Sicily, Caltanissetta nestles atop a plateau at 568m asl. Founded by the Greeks, it underwent numerous dominations over the centuries. It achieved its greatest prosperity in the beginning of the 20th century thanks to the exploitation of the sulphur mines, that remained a leading industry until few decades ago when the fierce competition from American companies caused the closure of all its mines. Till then, the sulphur was exported worldwide, Caltanissetta’s output accounting for 80% of the world consume. Caltanissetta is particularly renowned for the celebrations of the Holy Week: on Good Thursday groups of 19th century statues by Neapolitan artists are arranged to represent scenes from the Mysteries of the Passion, the Deposition being particularly impressing; on Friday’s, the statue of a Black Christ is carried through the streets of the city. Throughout the year the statues are kept inside the Church of Pio X on Via Colajanni. The old town clusters around Piazza Garibaldi – the jonction point of the two main streets and overlooked by the Town Hall (a former Carmelite convent), the Cathedral and the Church of Saint Sebastian with, like the churches of Sant’Agata (at the end of Corso Umberto) and Santa Croce (at the far end of Corso Vittorio Emanuele), a baroque dark-red colored front elevation contrasting with the natural-stone color of the other architecture. At the centre of the square rises the Fontana dei Tritone (1956), by Michele Tripisciano, a local artist, based on a 1800’s model. The bronze sculpture represents a sea-horse held by a triton while under threat from two winged monsters. Beyond the Town Hall, in the Salita Matteotti, stands the 1600’s Palazzo Moncada, remained incomplete; its façade features carved corbels in the form of human and animal figures (currently under restoration). The Cathedral – Erected at the end of the 16th century, it contains frescoes by the Flemish artist Guglielmo Borremans (1720). The alternation of painted panels and stucco decoration combines to produce a dramatic effect. The wooden statue of St. Michael, dated 1615, in the chapel right of the choir, is by the Sicilian sculptor Stefano Li Volsi. In the choir is a nice gilded wooden organ dated 1601. S. S. Agata al Collegio – It is located along Corso Umberto. The church has a composite façade made of red plasterwork, tufa stone and marble (the portal). Inside, it contains precious inlayed polychrome marble decoration and a beautiful marble altar-piece by Ignazio Marabitti. A statue of king Umberto I rises before the church. East of Piazza Garibaldi is the Quartiere degli Angeli (Quarter of the Angels), featuring a medieval look. At its centre stands the Church of S. Domenico with its fine curvilinear façade. A painting of the Virgin of the Holy Rosary by Paladini is preserved inside. Further along Via degli Angeli, perched on a rock, lie the remnants of the Saracen Castle of Pietrarossa. At the foot of the rock is the ruined church of Santa Maria degli Angeli, dating from the 13th century, retaining a fine doorway. The Municipal Museum – 1 Via Napoleone Colajanni (near the railway station). It collects relics discovered in the territory of Caltanissetta, from both the Indigenous and Hellenistic civilizations. Material from the Greek necropolises of Gibil-Gabib and Vassallaggi is displayed in the first two rooms. In the third room are relics recovered from the Greek city of Sabucina. Among these are: a small scale terracotta temple, a votive object from the 6th century BC, two large basins (one of them is on a high pedestal) served to contain drinks or oil (in a case on the left). A set of tea-pots used for boiling opium (13thcentury) and an attic kylix showing Heracles armed with a club – testifying to the hero’s popularity in Sicily – were discovered in the site of Dessueri. The four, and last, room gathers artefacts of the pre-Hellenistic civilization that are of particular interest. Worth-mentioning are the relief of a bull’s head and two bronze statuettes (7th-6th century) in the centre of the room. A bronze shin-guard and helmet from the Corinthian age (6th century BC) are displayed at the end of the room. Abbey of S. Spirito – Founded by Roger I in the 11th century, this Romanesque church was consecrated in 1153. It contains a beautiful wooden crucifix of the 15th century and a baptismal font decorated with stylised palmettes. The archaeological sites – The excavations – still in progress – are open to the public, although they are not very easily accessible and only rarely visited by tourists. They, especially, remain the preserve of archaeology and history lovers. Sabucina – Signposted off tthe main Enna road, 12km east of Caltanissetta. Here, traces of an early hut settlement (12C BC) have been brought to light, together with sections of walls dating from the 5th-4th century BC. Vassallaggi – From Caltanissetta take the SS 640 and continue in direction of S. Cataldo. Follow signs to a crossroad signposted for Serradifalco to the left and San Cataldo to the right. The sign erroneously direct to the right. Continue straight and follow the road. After a few metres take, on your right, a small tarred road bordered by a gate which is usually open, and follow it until it degenerates into a dirt track (a farm is on the right). A green fence on the right delineates the excavated site. The discoveries at the area include an ancient settlement and a temple dedicated to the underworld gods surrounded by some fifty buildings. Gibil-Gabel – 6km South of Caltanissetta. The site preserves ruins of an ancient Sican city with a necropolis. The restaurant Vicolo del Duomo, situated in a narrow street beside the Cathedral, serves delicious traditional dishes.